Sadie is on Inc.‘s Female Founders 100 list, has been featured on NPR’s How I Built This, and speaks regularly on the topics of mindful leadership, the power of body wisdom, and the movement to redefine what success in fitness means. Beyond running her company and being a global spokesperson, Sadie still enjoys teaching barre3 classes to many of her founding clients in her hometown of Portland, Oregon. Sadie’s first memory of been introduced to fitness was with Jane Fonda, in her living room with her mom. She fell in deeply in love with fitness when it began to serve her life in the most important of ways, which for Sadie was finding a community and connection. Sadie went to City College and then transferred to UCLA where she discovered the recreation center and felt an instant sense of belonging. She started participating in the group exercise classes and by falling in love with the energy created within those four walls she decided she wanted to teach and her career in fitness began. In addition to teaching students, Sadie also enjoyed leading other instructors. Sadie shares that to this day that’s what she loves most about teaching. She has been teaching for close to 30 years and every time she teaches she believes she still grows as a person with each class. One of Sadie’s superhero powers is seeing talent in other people and helping them discover their unique genius. She believes that every single instructor is so unique and so beautiful and has their own strengths, they just need to recognize them. One of the reasons she branched out on her own to develop barre3, was that she saw some things in the industry that she felt were broken. She shares that it wasn’t the industry’s fault, but rather how we were approaching fitness and the formulas created within the industry. These formulas and ideas were often attached to a person – a kind of a guru, a super athlete or someone who’s super aspirational. Oftentimes was models, athletes and people at the top of their game. And that fails most of us because none of us can be someone else. Then when we become attached to working out to become an ideal it often leads to dissatisfaction, depression, anxiety, low self-esteem, low body image, and most importantly a poor connection with fitness and moving. 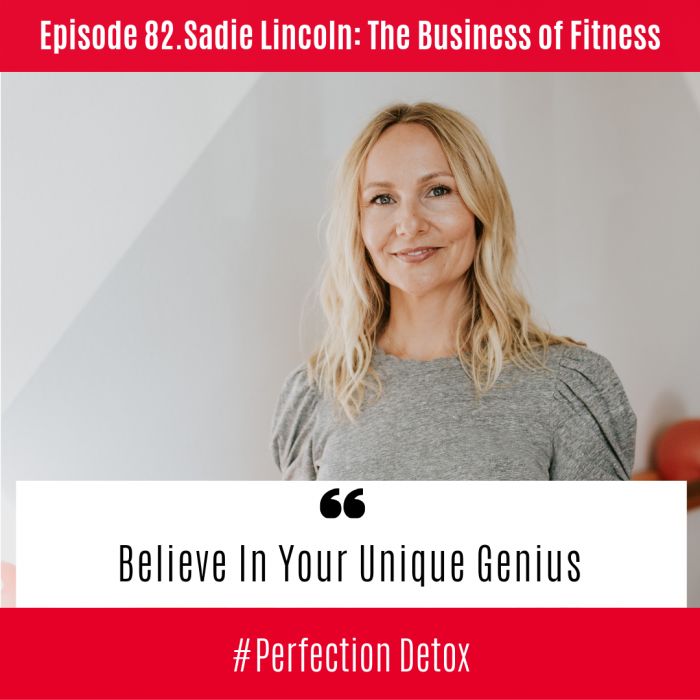 But Sadie believes that when we move to honor our own truth and to be our own best teacher, that is when we develop a healthy relationship with exercise. Sadie has a unique view of our obligation when showing up in any class setting. That is, it is our job to take our own shape, stand in our own body and make decisions that are right for us versus copying the instructors. She believes copying skips understanding and the reason that we should do fitness is to move and to grow and to understand ourselves better. And when we look at fitness that way, instead of striving for a hard body we can leave with a wise body. Sadie’s upbringing was unconventional. In the early ’60s, Sadie’s mom became really good friends with four other women. They all dropped out of the traditional lifestyle, became a part of the counterculture, and began experimenting with new ways of living. They lived in nature and studied psychology together. They ended up all being single moms and decided to raise their children together and collaborate. Some of what they followed involved dreamwork and so as a child Sadie experienced sitting in a circle, sharing her dreams and at an early age was offered the opportunity to look inside and understand herself in a meaningful and authentic way. She learned amazing tools that helped her to look inside for answers. Sadie saw that when you pulled back the camera, and you really looked at everything, just as fitness was rising and becoming increasingly popular, our national health was on the decline, obesity was on the rise along with body image and eating disorders. We fast forward and Sadie shares her journey to opening her first studio in Portland. All based on wanting to create a new way to share the joy of movement – she wanted to do it differently. They moved from Oakland and Portland where there wasn’t a lot of competition, put away all the business books and got to work. Instead of looking outside for the answers Sadie went within, asking, What do I need? What would I want in this product? She wanted light and so she had big windows everywhere. She wanted to make sure that the lobby was just as important as the exercise room, so Sadie made sure that everybody that works in the front lobby is equally trained as her instructors and that there was no hierarchy. On August 12th at 5:45 PM, the same day that she received her certificate of occupancy, Sadie taught her first barre3 class, and the rest was history. Many years later Sadie is still constantly changing and evolving in the class. One thing that never changes at Barre 3 is that things are always changing because the team is always listening and figuring things out in the moment. Based on science, physical therapists and most importantly their clients, Sadie is constantly evolving and mixing things up. Currently, there are 140 Franchises of barre3, with Sadie and her husband owning six of the studios. The company is still privately owned and funded. Sadie offers full support to her franchisees and has over 50 full-time employees. Her investors are women and Sadie is committed to empowering the owners with all the tools and strategies needed to create a thriving business. Sadie shares that with the business comes rollercoaster ride, one that she has learned to relax into. She constantly is asking herself, “What’s best for Barre 3? What’s healthiest for all these owners?” and that leads to growing as an individual. Her clients are growing, her owners are growing, her team is growing. Everyone rises together while growing in different ways. When we can look within, that is how we continue to create change that is in service of others.